Ascarius enters the Doctor's room and they struggle. Vicki enters threatening him with a vase and he accidentally tumbles out the window! The Doctor boasts how he enjoyed their fight. Barbara has arrived in Rome where she is locked up in a cell. She wonders where Ian is: he's found himself rowing on a Roman galley. The galley master tells them bad weather is expected. A slave buyer has taken an interest in Barbara: the bald Tavius. He asks the traders if he can buy her but they insist she will be sold at auction. The boat Ian is on has met the promised bad weather and sinks. Vicki ^ The Doctor have also now arrived in Rome and narrowly miss seeing Barbara being sold at the auction: They believe she's still at the villa with Ian. Tavius wins the auction with a huge bid. Ian has been washed up on the shore with another prisoner, Delos, who frees him from his chains. 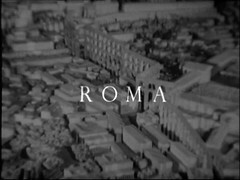 Ian intends to make for Rome to find Barbara. Tavius tells Barbara he was impressed with her actions in caring for another prisoner: He has brought her to Nero's house where she will be a servant for Nero's wife Poppaea. 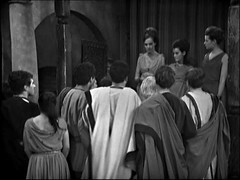 They are interrupted by a servant who tells Tavius that Maximus Pettulian (who we know is the Doctor) is here to see Nero: after first wanting to summon him here, Tavius leaves to meet him with Barbara narrowly missing the Doctor again. During their audience Nero arrives. 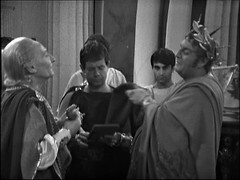 The Doctor bluffs to try to avoid playing the lyre for him. Ian too has arrived in Rome with Delos. 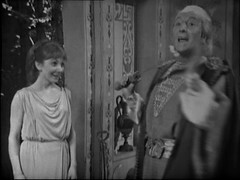 The Doctor & Vicki find the body of the murdered centurion and wonder what has happened. Ian has been captured and delivered to the same slave traders who sold him earlier, where he is noticed by the girl Barbara cared for earlier. He is destined to fight in the arena as a gladiator against the lions! MESSENGER: Maximus Pettulian from Corinth has arrived, sire, and with a small girl. He requests an audience with Caesar Nero. TAVIUS: Pettulian? Very well, ask him to come in. TAVIUS: No, wait. On second thoughts, perhaps it would be better if I came out to see him. Then we have the rather camp Emperor Nero and the antics with the lute & stool and Ian ending back with the same slave traders that captured him in the first place! Hartnell, as in the Spooner's previous story the Reign of Terror, seems to be having some fun here with the comedic elements. 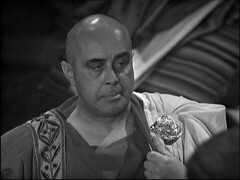 The main guest star for this serial is Derek Francis playing Nero. He was at the time a major actor, probably the biggest guest star the series had attracted so far, possibly in no small part down to him being friends with Barbara actress Jacqueline Hill and her husband Alvin Rakoff. 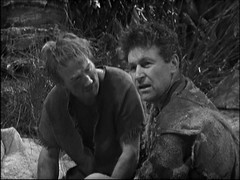 I've not seen Michael Peake, Nero's slave master Tavius, in anything else but he appears to have died the year after this episode is broadcast. Brian Proudfoot is Tigellinus, Nero's cupbearer. 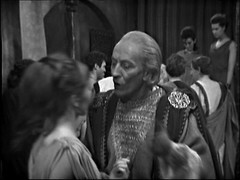 He doubled for Hartnell previously in the location sequences in Reign of Terror, where he also played, uncredited, a Parisian citizen, before doubling again for Hartnell in The Space Museum then appearing as an Aridian in The Chase. Another member of the cast to double for the Doctor during his career is well known Stuntman Peter Diamond making his first Doctor Who appearance as Delos, Ian's fellow prisoner. He'll be back in The Space Museum episodes 2-4 as Morok Technicians and Guards, The Highlanders episode 2-4 as a Sailor, The Ice Warriors episode 1 as the ill fated Davis, as an extra in the first episode of The Enemy of the World before returning in the sixth to double for both the Doctor and Salamander. His last Who appearances are in The War Games where he's a Confederate Horseman in episode 4 and an Alien Guard in episode 9, both uncredited. He served as a fight arranger on several episodes and his long career takes in about everything you can think of including the Star Wars films and Indiana Jones movies. 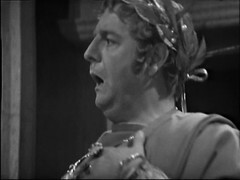 Gertan Klauber, here as the Galley Master, returns in The Macra Terror as Ola. In the same story is John Caesar, one of the Men in Market. He appears in The Dalek Masterplan 10 : Golden Death as an Egyptian Warrior, The Ark 4: The Bomb as Monoid Four, The Gunfighters as a cowboy, a Guard in Macra Terror, a Pirate in episode 1, 3 & 4 of the Space Pirates, The Sea Devils: Episode Six as C.P.O. Myers and Invasion of the Dinosaurs part 1 as the R / T Soldier. The other Man in the Market, Ernest Jennings has just a peasent in The State of Decay 1 and an Aged Rebel in The Trial of a Time Lord: Part 5 to his name.